Have you been sitting around waiting on your stress level to drop, your energy level to rise, and, your health to improve? There is no "one stop fix it all cure", but yoga can be a very invigorating start. It has many health benefits; for example, improving strength, flexibility, & posture.. It helps to keep the body, mind, & spirit in shape through controlled breathing & body posture exercise. Yoga can also leave you feeling energized & ready to conquer the world. Go ahead. Give it a try. You just might like it, but I recommend you check with your doctor before starting a rigorous routine. Hold up - wait a minute ! Before you say I don't have time for that, you wouldn't believe some of the other benefits it has for your mind & body. To name a few, It can help alleviate stress & improve circulation of blood. Believe it or not, what effects your mind & body can effect your beautiful tresses. We all go through things that may causes stress. You know like those bills that keep coming around every month or those long hours working without a break. I can go on & on about things that life may bring to stress you out, but count it all joy that you are alive to experience those things. Yes, I know, Stress can have some detrimental side effects to your health & body. One side effect may be the possibility of massive hair loss. That's not good... No, that's the last thing we desire. We want to keep that beautiful head of hair unless we choose to shave it to achieve a certain style. Of course, we naturally shed a certain amount of strands a day, but let's try to keep it to the normal amount ladies. You to gentlemen! You don't want to wake up one morning and see patches missing from your hair while getting ready for your day. Let's try to keep stress induced hair loss away by implementing a yoga routine; meanwhile, releasing negative energy & concentrating on the matter at hand, to help alleviate stress. The controlled breathing in yoga may help relieve some forms of anxiety that you may be experiencing. No-it want make your problems go away, but It will give you time to get yourself together so that you can function correctly to help solve your problems at hand. You will be to busy concentrating on yoga, that you want have time to be stressed in the moment. 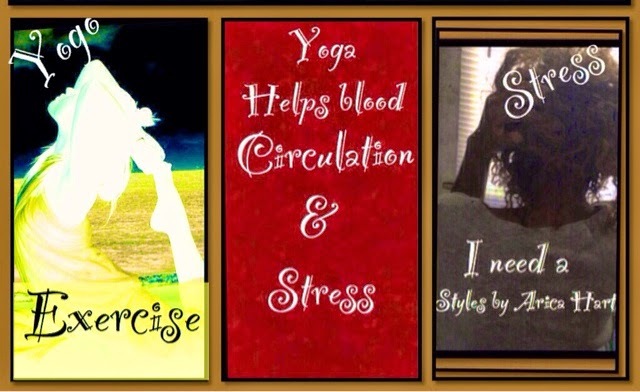 Did you know, Yoga helps improve the circulation of blood? That blood helps transports nutrients & oxygen throughout the body, to provide healthier skin, organs, & brain. Sounds great doesn't it. Of course it does! Let me tell you why !!! Just as our skin needs that nutrients, our hair follicles also needs a good supply of blood to maintain healthy hair as well. Hair usually grows between 1/4" and 1/2 " each month, when it's not in the resting phase. Hair growth will go through the different stages & grow appropriately as long as the adequate nutrients are provide. That nutrients comes from a proper diet, but also through proper blood circulation; so that, the the blood, oxygen, & nutrients can reach the roots in the follicle. Try scalp massages & a little yoga to ge that blood pumping & circulating to all parts of the body. Make sure to consume the proper nutrients in your food or supplements, because the nutrients will go through your blood circulation to the most needed organs before going to your hair. Therefore, if there is no nutrients left after feeding the heart & other major organs, the hair will go lacking. So keep that blood flowing, so that nutrients can reach your follicles to help feed it. Try doing yoga to help with the process of hair growth; meanwhile, helping the skin, organs, & brain also . Therefore, we know that low levels of stress & good blood circulation can help improve our hair health by relieving hair breakage & getting the proper blood flow (nutrition) to the hair follicles. So you may want to try a few yoga poses to improve your hair growth, stress level, circulation, cardiovascular system, & other health benefits. If your looking for a class, try your local gym. Oh yea, if money is a problem, that's not an excuse because you can do yoga in the comfort of your own home. No more excuses now, huh. That's right - Make sure the poses are done correctly by studying the correct form & technique. Don't you ladies & gentlemen forget to get the adequate nutrition & vitamins with your yoga or exercise routine. Be careful & have a blessed day getting your mind, heart, body, spirit, & hair into shape !! Have you ever tried yoga? Do you like to do yoga? If so, did you feel different after your yoga class? What do you think about the benefits of yoga? Leave a comment below and tell What you have to add to the conversation !!! 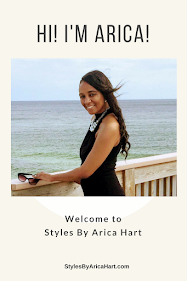 Styles by Arica Hart: team healthy mind, heart, body, spirit & hair !! !